How do you empower people to open up about mental health concerns and seek help for themselves and others when needed? It’s an important question, and one that Cincinnati Children’s Hospital Medical Center and TiER1 have thought about for some time (although in different ways). Until recently, when our organizations teamed up to reimagine a mental health program. Since 2001, Cincinnati Children’s has delivered a teen suicide prevention program to schools in Greater Cincinnati. But the organization wants to do more of a good thing—they want to impact more diverse groups of people and they want to further destigmatize mental health and mental illness topics. That question of equipping people to adapt and thrive is also important at TiER1. 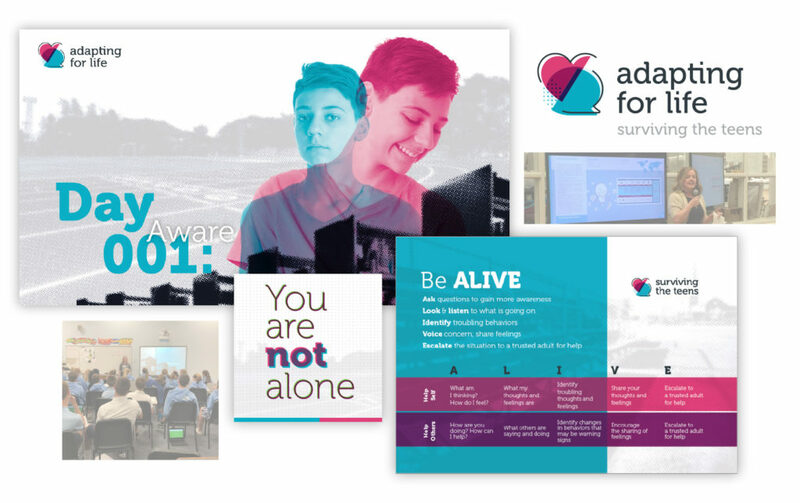 In 2015, our company engaged in learning about mental health and mental illness in a very real way. What we continue to learn in this space is that, although suicide is a national and growing epidemic, the mental illnesses and health issues contributing to people thinking about suicide are well known and can be treated—and the earlier we target symptoms, the better. 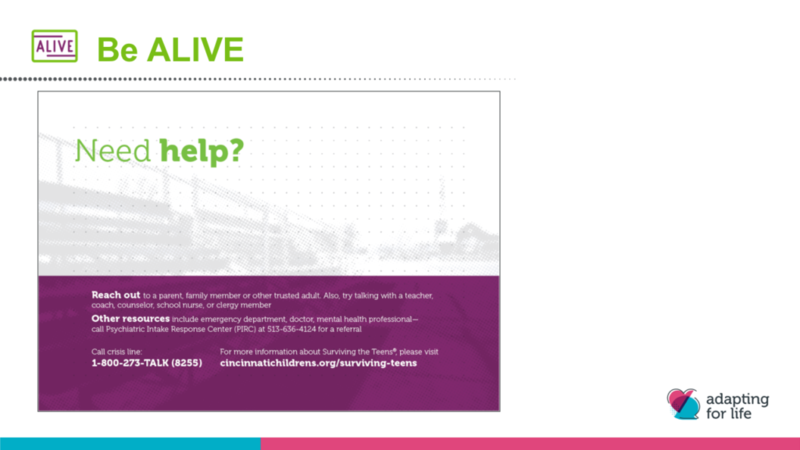 Building on Cincinnati Children’s existing suicide prevention program and TiER1’s commitment to promoting mental wellness, TiER1 is proud to collaborate with Cincinnati Children’s in the development of Adapting for Life, Surviving the Teens. Adapting for Life is a scalable, modular mental health program that equips participants with the tools and conversations they need to navigate life and thrive. 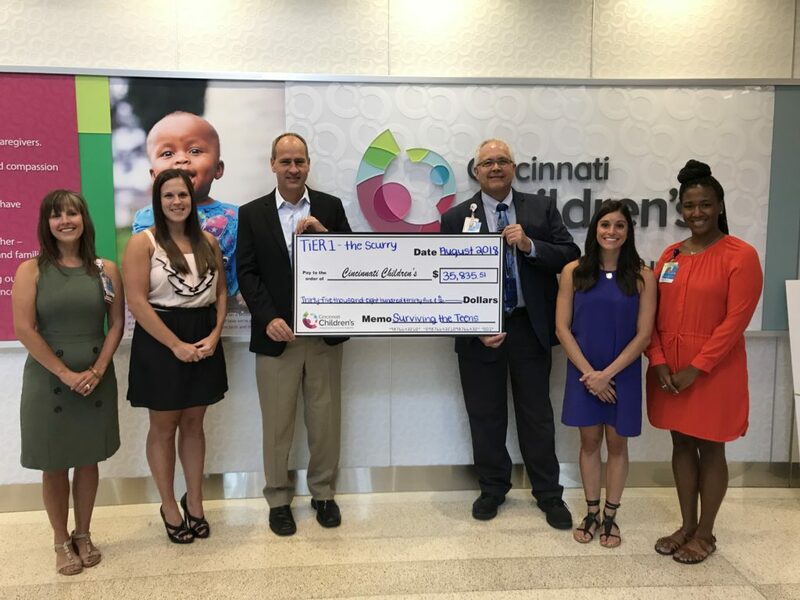 On Friday, May 11, 2018, 31 teams competed in TiER1’s The Scurry to raise money for Cincinnati Children’s teen suicide prevention program. TiER1 presents a check for $35,835.51 to Cincinnati Children’s. Pictured from left to right: Stacey Hoffman, Christine Seiler, Greg Harmeyer, Dr. Michael Sorter, Christina Misali, and Katherine Hamner. We knew that Cincinnati Children’s wanted to update the structure of the program so that different facilitators could deliver it in different time lengths. TiER1 is developing five learning modules that corresponded to ADAPT model (Awareness, Describe, Assess, Plan, Tackle). These modules incorporate a mix of case studies and personal stories that provide meaning and context to other program content and mental illness research. They also enable facilitators with different backgrounds and areas of expertise to adapt their delivery of the content. TiER1 designers are collaborating with Cincinnati Children’s clinicians to develop several tools and conversation starters for each learning module. These tools empower participants to seek help and provide support to people around them during times of stress and ambiguity. In addition to updating the look and feel of program materials, TiER1 has reframed the program focus around the participant’s role and their goals. This new focus provides hope to participants as they learn about behavior and thought patterns. A key component to this mental health program was designing a relevant participant experience for a broader audience that integrates experiential activities such as reflection, group activities, and real-time feedback surveys throughout the modules. We also are crafting an Experience Journal for participants that will include information for immediate help in times of crisis as well as plenty of space for participants to record their thoughts and program notes. These interactive experiences make the overall program more engaging for participants. Founded in 2002, TiER1 Performance Solutions is an employee-owned consulting firm that activates strategies through people. As a Certified B Corporation®, we are passionate about consulting, designing, and building people-centered business solutions that deliver meaningful, long-term success. We believe that the potential for any organization lies within its people. By unleashing the best of both, we will change the world.